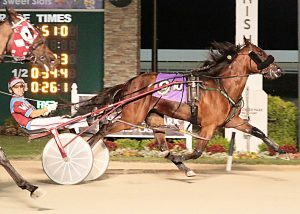 The Indiana Standardbred breeding program has catapulted into national recognition over the past five years, and another star emerged Wednesday, July 11 in the $75,000 final of the Indiana Sires Stakes for two-year-old fillies. Tellitsassymae and driver Sam Widger rolled under the finish line in a time of 1:51.1 to establish a new national season’s mark for all two-year-old pacers. Tellitsassymae, owned by Henry Blackwell and Darla and Emily Gaskin, is trained by Ernie Gaskin. It was the third win of the year for Tellitsassymae, a daughter of first crop sire Tellitlikeitis, who stands for $3,000 at Victory Hill Farm. Tellitsassymae is now the most successful daughter of the Well Said stallion, who may be emerging as the year’s “sleeper” stallion on the Indiana circuit. With 111 mares bred the first season in 2015, a total of 76 foals were registered with 44 of those selling a public auction. So far, Tellitlikeitis has produced 38 starters, 13 of which have taken marks under the 2:00 mark. Of those 13, 4 have dipped under the 1:55 barrier. Joining Tellitsassymae on that elite list is Tellmeaboutit, Imonlytellinyaonce and Outloud. Tellitlikeitis, still owned out of Canada, has the pedigree to be a great sire. His mother, Kikikatie, was a former champion, winning 14 of 15 starts at two. She completed her racing career with a mark of 1:50.3 and more than $1 million in purse earnings. She is a 100 percent producing mare with all five of her foals taking a mark of 1:50 or under and all earning six-figure purse money. Tellitlikeitis is the only foal by Well Said and was her final foal. The other four are by the sire Rocknroll Hanover and includes Rockin Image, Grams Legacy, Time To Roll and Rockin Amadeus. Products of Tellitlikeitis are also seeing some success on the Indiana fair circuit. Dojea Rita, owned by Joe Smith and Michelle Graves, has earned numerous wins this summer, including one earlier this week at Frankfort. She is trained by Donna Loney and driven by Rocky Loney. Isitlikeitlooks, driven and trained by Jeff Dever for Brian and Jane Mast and Jeff and Kathy Cranor, has also found the winner’s circle several times this summer at the fairs.